This states that the output rate is equal to the population level multiplied by the population's average consumption rate. Obviously, there are numerous combinations of these two factors that will result in a specific output rate and thus specific environmental effects. To pick a few examples, an output rate of 200 units per year will result from population-consumption combinations of 100 and 2, 50 and 4, 20 and 10, and 2 and 100. From the environmental perspective we are interested only in the result — the output rate — and we are therefore indifferent to the specific combination of the two factors that produce the result. 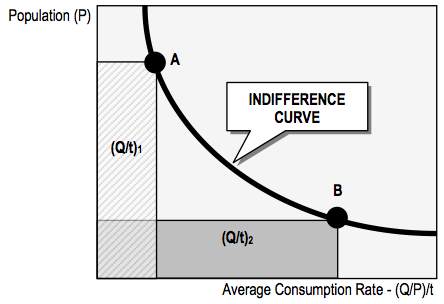 Because such relationships arise frequently in economic analysis, standard economists have developed a handy analytical tool to deal with them: the aptly named indifference curve. The following figure shows how such a curve can be applied here. Any point on the curve represents a combination of population and average consumption rate that results in the same output rate, hence the same area under the curve. Thus, (Q/t)1 = (Q/t)2. ￼￼￼In the graph, population is on the vertical axis and average consumption rate (hereafter simply "consumption ") is on the horizontal axis. The curve represents all combinations of these two factors that result in the same output rate. Two examples are shown. At point A population is high and consumption is low. The output rate is the product of these two, represented by the shaded area at left. At point B population is low and consumption is high. The output rate is the same, as indicated by the equivalent area at bottom. In the overshoot model this indifference curve is treated as the economy's impact limit — that is, the maximum output rate that does not cause environmental degradation. The curve thus defines a highly significant boundary: between population-consumption combinations that result in impact sustainability, and those that result in impact overshoot. This distinction is shown in the following figure. Here the indifference curve represents the impact limit. All points on or below the curve, such as A, represent impact sustainability. 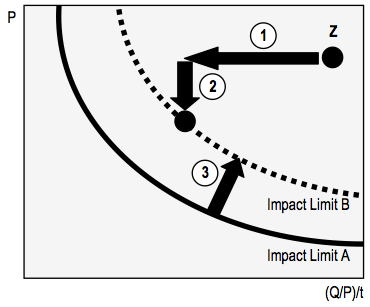 All points above the curve, such as Z, represent impact overshoot. ￼￼Here point A indicates impact sustainability. For any point on this side of the curve, the output rate is below the maximum sustainable level, and the area underneath the curve is smaller than those in the preceding figure. For any point on the other side of the curve, such as point Z, the output rate is above the maximum sustainable level, and the area underneath the curve is larger than those in the top figure. If you are unclear as to why these areas represent the output rate, remember that the area of a rectangle is calculated by multiplying the length of its two sides. In the graph these lengths are represented by P and (Q/P)/t. If we multiply these two dimensions the P's cancel out, leaving Q/t — the output rate. The model in the this figure is already somewhat useful, but it lacks two essential features: the resource limit, and a way to represent ecological efficiencies. The resource limit is straightforward. It is similar to the impact limit in that it is violated by an excessive output rate. It can therefore be represented by a similar curve, although one that is closer to the graph's origin. The reason for this can be seen by referring to the graph depicting overshoot: the resource limit was historically reached before the impact limit, and the curve must therefore represent a lower output rate. The following figure shows both limits. These two curves depict the two ecological limits. Because the world economy first encountered the resource limit, this is placed below the impact limit. ￼As you can see, there are now three possibilities for the world economy. It can be at a point such as A, in which case it has violated neither the resource nor the impact limit, and is therefore fully sustainable. It can also be at a point such as B, in which case it has violated the resource limit but not the impact limit. The economy is therefore in resource overshoot but not in impact overshoot. Finally, the economy can be where it is today: at a point like Z, which signifies both resource and impact overshoot. Ecological efficiencies are incorporated into the model by noting that higher efficiencies permit the output rate to rise without increasing the resulting environmental effects. This is why, in the figure illustrating overshoot, improved efficiencies shift the impact limit to the right. The equivalent in the overshoot model is to shift the resource and impact curves away from the graph's origin. This is depicted in the following figure, although for visual clarity only the impact limit is shown. 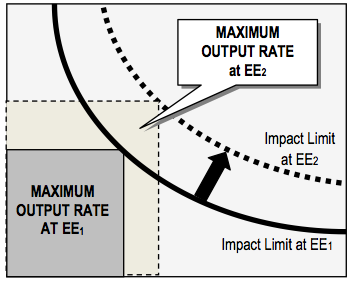 The smaller shaded box represents the maximum allowable output rate at the impact limit associated with ecological efficiencies EE1. Increasing these to EE2 will shift the curve outward, which means that a higher output rate is possible without violating the impact limit. ￼￼A slight complicating factor is that the set of outputs requiring increased ecological efficiencies differ for the two limits. The impact limit is set by outputs that cause environmental destruction, which can result from any of the biological flows: utilization of renewables, habitat destruction, and wastes. This limit is therefore shifted out by increasing ecological efficiencies for outputs that are associated with the most damaging of these flows. The resource limit, on the other hand, is set by the economy's overall use of renewable resources. This limit is therefore shifted out by increasing ecological efficiencies for all outputs with respect to renewable resources specifically. At this point the model allows us to depict the three factors responsible for the ecological crisis, and to distinguish between resource and impact overshoot. To see how the model can orient our thinking with respect to overshoot reversal, see the following figure, which addresses the priority task of impact overshoot. 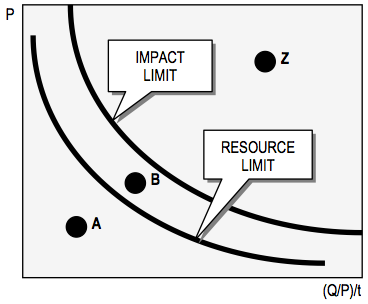 The world economy must move from impact overshoot point Z to a point on or below the impact limit curve. This can be achieved through various combinations of reduced consumption (1), reduced population (2), and higher ecological efficiencies (3). 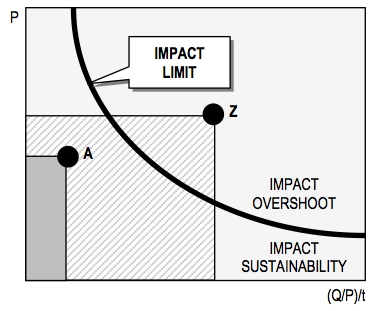 In the figure, point Z represents the world economy's current state of impact overshoot, and impact limit curve A represents the current level of the associated ecological efficiencies. It is visually obvious that each of the three overshoot factors, by itself, could reverse impact overshoot. A drastic decrease in consumption would shift point Z to the left until it hits curve A, which would do the trick. Similarly, a drastic population reduction would shift point Z down until the limit was encountered. This too would reverse the overshoot condition. Last, a radical increase in ecological efficiencies would shift the limit curve all the way to point Z, which would eliminate impact overshoot without decreasing the output rate — that is, without undergoing rapid contraction. Although such single-minded approaches are possible, a combination of the three factors will in most cases be preferable. The figure depicts one such combination: a substantial decrease in the consumption rate (1), a modest decrease in the population level (2), and a significant increase in ecological efficiencies (3). The "correct" combination, both for the world as a whole and for individual countries and regions, is the one that can be achieved most quickly and with the least social disruption. The above comments also apply to the reversal of resource overshoot. In that case the starting point would be a point Z that is at or below the current impact limit curve, and the challenge would be to move this point down to the resource limit curve through a carefully considered combination of rapid contraction and increased ecological efficiencies for renewable resources. A final point must be made about the overshoot model. The biosphere could easily undergo a collapse from humankind's economic activities, leaving the integrity of the world's ecosystems severely impaired. The Amazon, for example, could soon be transformed from a tropical forest to a savannah of grasses and sporadic trees. Such changes would have two broad effects: it would reduce the capacity of the environment to absorb our economic wastes, and it would reduce the flow of renewable resources. A savannah-like Amazon, for example, would sequester greenhouse gases and provide lumber at much lower rates than a heavily forested Amazon. In the overshoot model these changes would be reflected as shifts in the resource and impact limit curves towards the origin. The practical result would be to complicate the tasks of rapid contraction and improving ecological efficiencies. If impact limit A in the preceding figure were significantly closer to the origin, humankind would find it much more difficult to reach impact sustainability. The same can be said for resource sustainability. Thus, if ecological collapse occurs despite our best efforts, it can be represented in the overshoot model through the indicated curve shifts.